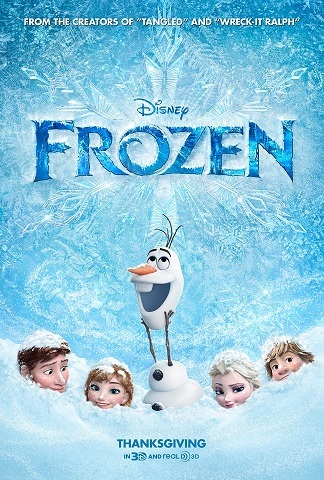 Frozen is a 2013 American computer animated musical fantasy film released by Walt Disney Pictures. Loosely based (And I do mean LOOSELY) on Hans Christian Andersen’s fairy tale The Snow Queen, the film tells the story of a fearless princess Anna (Kristen Bell) who sets off on an epic journey alongside a rugged, thrill-seeking mountain man Kristoff (Jonathan Groff), his loyal pet reindeer, and a hapless snowman Olaf (Josh Gad) to find her estranged sister Elsa (Indina Menzel), whose icy powers have trapped the kingdom in eternal winter. You may have seen some trailers proclaiming that this is the best Disney film since The Lion King. Is it? Well, no, not really, but it’s very very good. First of, the visuals are outstanding, some of the best I’ve ever seen in a Disney film. The effects on Elsa’s snow powers are truly jaw dropping and just gorgeous to look at. The characters are awesome too, they’re well written, well animated, likeable, funny and just a lot of fun to watch. What’s great about this film is that the heart comes from not the Princess and the Prince cliche, but the relationship between the two sisters, Anna and Elsa. We haven’t really seen Disney tackle a relationship like this, but it really works. Anna is a ton of fun, she’s sweet but has her limits, well mannered but incredibly goofy at times and like any good character, she has heart. She loves her sister and only wants them to reconnect (Elsa has been told to stay away from Anna in case her ice powers hurt her) You really do buy their relationship and you want them to work things out and be best friends again. Speaking of which, the music is awesome too. Okay, it’s not Alan Menken, but the score is very beautiful and calm. Giving homage to the Norway and Sápmi-inspired setting, the composers truly create a beautiful musical journey. Voice acting from everyone is great, and the comic relief is good too. I was expecting to despise Olaf the snowman, but you know what? He was hilarious! I loved his running gag about wanting to see Summer, though he has no idea that he will melt if he ever sees it. Funny and poignant at the same time. So, after hearing all this, the film seems perfect right? Well, there are some problems. First of, I do feel the story is a bit rushed at times, in particular the third act, the ending seems to occur way to fast. I was kind of hoping for a few extra minutes to bring closure and maybe a big booming broadway reprisal song, like most Disney films have, which we sadly don’t get. The other songs are good, but not as memorable as ‘Let it go’. They’re around 9 songs in the movie and I really only remember two: ‘Let it go’ and ‘For the first time in forever’ Both have great lyrics and music and are really fun to listen too. The other one’s aren’t necessarily bad, they’re just not as good. For example, there is a song in the middle in which a family of trolls sing about how Kristof would make a good boyfriend for Anna. This song really does not add any purpose and it seems out of place. The villain is also quite weak. There’s a twist about who the villain of the film really is and while it is fairly well written, it’s also not very strong and a touch predictable. I would have also liked to get more backstory of the characters, like we never learn how Elsa got her ice powers, all we get is the fact that she was ‘born with them’, I’m sorry but that’s a pretty lame excuse. Also, I feel the third act of the film wasn’t as strong as the previous two. It was still good, but it seemed to be far to rushed, especially the climax. So, overall even though this film does have flaws, I can’t deny that this was a fantastic film. The positives far outweigh the negatives. It’s great to see Disney returning to their roots of making pure, magical, funny, touching and beautiful films. I definitely recommend it to any Disney fan and fans of cinema in general. It really does have something for everyone. I’m sure Walt himself would be proud of this one.